Guinea Fowl are part of the pheasant family. They have beautiful plummage and unusual heads. Their behaviour is fascinating to watch. 2) They do not like to be alone. 3) These birds like to eat together. 4) Male guinea fowl like to chase each other about – one will be the chaser and when the chased guinea fowl is caught, they then turn around and reverse their roles. 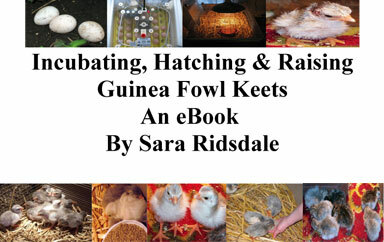 5) Guineas prefer to run rather than fly. 6) In a small group, the male guinea fowl is generally monogamous but can form a group with two or three females. 7) When the female is laying the male stands guard. 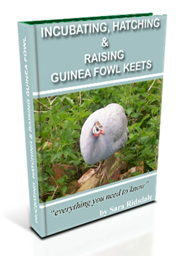 8) Female guineas often share nests. 9) They are very noisy, vocal birds. 10) When confined or crowded they will run up and down repeatedly. 11) Guinea fowl sometimes like to look at their reflection in a window or mirror. 12) These birds like to dust bath in soft, sandy soil. 13) Guinea fowl love to stand in the sunshine. 14) My guinea fowl are not afraid of the cats or cattle.